I absolutely love discovering an indie brand that has an awesome product that I know one day will be a household name. Skin Like Butter is one of those brands. Presently selling online and at a farmer’s market in California, one day this brand will be seen in the magazines, on TV, heck- dare I say Sephora? Just remember that you heard it here first. 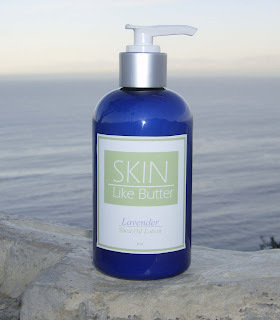 Skin Like Butter’s amazing Aloe and Shea Butter Lotion is deeply hydrating while light in texture. I have the scent “Fresh Laundry” which is that fresh off the clothesline fragrance. Crisp and breezy air, Fresh Laundry is such a clean scent. Skin Like Butter’s Shea Oil Lotion is a steal at $15 for an 8oz. bottle. Visit their etsy shop for more info! Thanks for the review. I decided to buy the Shea Oil Lotion and the unscented Sample Kit. hmmm skin like butter. does it mean extra extra oily?